Hugh Jackman recently confirmed on “Live with Kelly and Michael” that the currently Untitled Wolverine Sequel will be his final swipe at playing the character. 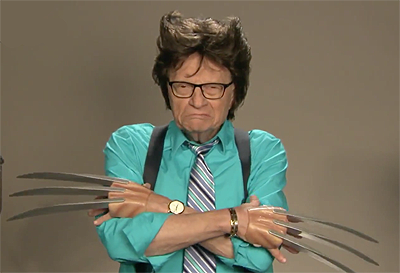 Now Conan O’Brien has given him a few more reasons not to hang up the claw and sideburns just yet, as the late-night host held auditions to take over Wolverine and they ain’t pretty. Check them out below! Featured in the video are Thomas Middleditch, Nick Offerman, Patton Oswalt, Hannibal Buress, Larry King, Michael Sheen, Kristen Schall and, of course, the incomparable 93-year-old Betty White, all trying to claw their way to the A-list. “Conan” airs weeknights at 10pm/11c on TBS. 20th Century Fox will release the next Wolverine solo film on March 3, 2017.